Talk with Tidewater Community College student Elisabeth Richardson and you’ll understand why her exemplary leadership makes her a fitting recipient of the 2016 Dr. Martin Luther King Jr. Scholarship Award. The homeschooled Portsmouth native didn’t grow up hungry, but combating food insecurity motivated her to start her own outreach for those less fortunate than her. “Some people have to decide between putting food on the table and paying the light bill,” she said. Richardson is founder and director of a food pantry and community garden operated from River Shore Baptist Church in Portsmouth. What started as her capstone Girl Scout Gold Award project blossomed into an outreach connected with the Foodbank of Southeastern Virginia. It distributes healthful food to families one Sunday a month at the church. 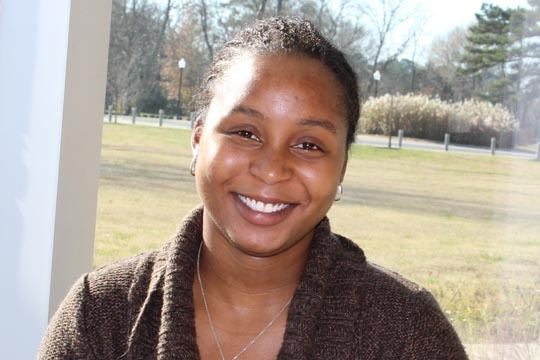 Richardson, enrolled in 16 credits this spring, is finishing her final two semesters at TCC, working toward an Associate of Science in Business Administration. Her list of possible transfer destinations includes the University of Virginia and Virginia Commonwealth University. She plans to double-major in accounting and finance. She wants to follow that with a master’s in management and a doctorate in decision sciences. “This scholarship means so much because it will cover my tuition the last two semesters,” she said. “I always said I was going to go to college and finish without any debt, and people said I couldn’t do that, but I did. Richardson’s time at TCC has exceeded her expectations, especially when it comes to mathematics Professor Richard Duncan and biology Professor Sarah Riggs-Shute – “two of the best professors I’ve ever had,” she said. The college came highly recommended to her, as two of her siblings are graduates. Both received Associate of Science degrees. Richardson is a member of Phi Theta Kappa and one of the founders of the National Society of College Scholars on the Portsmouth Campus. Her vision for the future includes working for a Fortune 500 company and owning as many as four businesses: an accounting firm, a spa, a salon and a winery. She plans to always give back to the community.